Originally The Gold Coast Branch of QMTA Inc. was established by a committed group of music teachers. This has grown to a friendly and flourishing committee with a growing professional and associate membership who meet regularly for meetings, professional development workshops, student based activities and social events. In 2010 the Branch changed to QMTA Inc. Gold Coast Teacher Group Committee when it combined with Central Branch Brisbane where the business and memberships are handled. The Teacher Group continues to promote and present various activities and the dedicated committee remains enthusiastic in providing opportunities for teachers and students of the Gold Coast and elsewhere. QMTA Inc. Gold Coast Teacher Group Committee holds 4 meetings per year. These friendly meetings are efficiently conducted with the promotion of music education and encouragement of teachers and students. The meetings also serve as a chance for teachers to network and share information and advice. Please contact Jenny Wilkinson jwilkinson@iinet.net.au if you are interested in attending - we'd love to see you. Next meeting - Sunday 5th May. An opportunity for students to perform at a suitable venue in a very encouraging atmosphere. Members’ students of any instrument/voice are welcome to perform one or more pieces which helps develop confidence, and promotes the sharing of repertoire and musical styles. Plans are in motion for our 30th anniversary competition to be held on Sunday 2nd June 2019. Updates will be posted on this page as they become available. Email goldcoastqmta@gmail.com to be added to the email list. We cater for emerging composers as young as 4 years of age through to the open sections, from Local Gold Coast sections to the Open junior and Open Senior to all areas / states / international. Entrants perform their original works (or for those who are unable to attend, via CD recordings). A score must be provided for the adjudicator.These must be posted to 20 Etna Court , Isle of Capri QLD 4217 and be received at least one week prior to the competition date. Many of the works presented in the Composers’ Competition are actual “world premieres” and it is a special event to hear these new and dynamic compositions which are shared with a very open and appreciative audience. Works presented represent various instruments, keyboard, voice, ensemble, or combination with a wide range of styles. Many entrants have gone on to continue their composing careers having had encouragement from our competition. In fact, some past entrants have indicated that it was our competition that introduced them to composition where they had not considered this as a means to express their musical language. The Composers’ Competition is a means to encourage the creation of and pursuit of original Australian music. As a tribute to the composer/adjudicator, students and teachers perform works by the adjudicator thereby encouraging others to perform these works in future. During the event, the composer/adjudicator gives a lecture/talk on composing, which is greatly received by those present. The annual Composers’ Competition began in 1989 with its inaugural adjudicator Dulcie Holland. Since its early beginnings, the competition has become a major event hosted by QMTA Inc. Gold Coast Teacher Group Committee. All of our composer/adjudicators have made comment that our competition is a unique and worthwhile event through the enthusiastic support we give to students and emerging composers and the promotion of original Australian music. 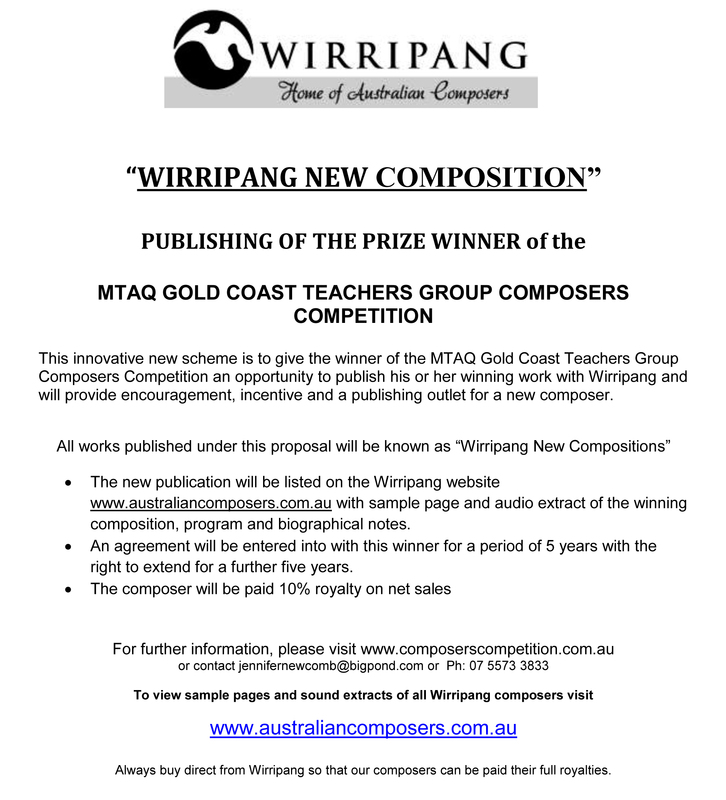 On 21st May our 29th Composers’ Competition was held on the Gold Coast. Composers from as young as 6 years through to 80+ came along and performed their works live, or for those unable to attend, recordings were sent and played for the audience to listen to. There were ‘world premieres’ of many fine works performed and the adjudicator, audience, committee and composers all agreed that this was a great arena for sharing their works, to receive feedback from the judge and more importantly to use their own original works to communicate with those present. A large proportion of works were for piano, however there were ensemble, instrumental and vocal works plus some innovative film scores which accompanied visual stimulus in the specific audio/visual section. Our Gold Coast Teacher Group would sincerely like to thank our sponsors for their support, which hopefully will allow this worthwhile event to continue into the future. Thankyou to all our generous sponsors who enable the Gold Coast Composers’ Competition to take place each year.